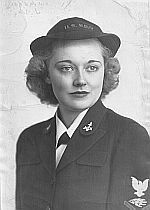 Emma Lou Lorene Jackson, born 1922, Holland, MN, older brother Charles Jackson served in the army during WWII. 1929 the family lost their farm due to the depression. Mom's dad died in 1933. Grandma Jackson did not want to farm out the kids to relatives which was common in those days. She took in boarders, did laundry and sewing to make ends meet. Mom has told me stories of hobos stopping by and grandma always fed them. When mom was 19 she moved from MN to Charleston, WV as a radio control room engineer and announcer, also wrote continuity for radio shows. Mom was one of the first women in the country doing this. Mom remembers being at the Homestead Restaurant in Charleston when hearing about Pearl Harbor. 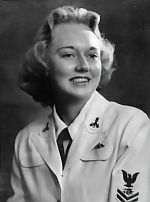 When the Navy started accepting women, she joined up and taught radio communications to allied pilots so all could communicate. 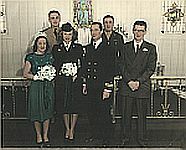 After the war, the government kicked all the women out and mom met dad and married in 1946, moving to Lake Bluff, Ill. Dad, also a WWII vet loved taking us kids to Great Lakes and Glenview NAS. We kids loved it too. Mom then was editor of magazines and newspapers, stopping after having four children. They lost their oldest boy, Bobby, when he was 18 and a boy shot him and stole his car in 1967. Being divorced just before this happened made 1967 a very tough year for mom. For mom's 80th birthday my sister, Pam, and I took mom back to the farmhouse her folks built in 1918, that was one of the coolest trip ever!! Mom is 90 now and lives near me and I feel so fortunate to have such a cool, tough, wonderful mother. I was lucky enough to be able to retire from Fed Ex to take care of mom. The Asheville, NC Charles George VA home care and I did all we could until it got where mom could not live without 24/7 care. Mom is part of the greatest generation this world has ever seen! Copyright © 2012NASGIVM All rights reserved.